Unlock the full Homeworld experience with all 8 main races, each fully playable with their own unique units, abilities, and playing styles. The FXmod adds depth and increased tactical options to the base game, and comes with new HD units, animations, fx, content, and unique features to bring you closer to the ultimate Homeworld experience. Content Update + AI/Balance Adjustments. New Challenge Mode, AI Overhaul, bugfixes & more. Comes with an installer. FX:G v1.30 - The Shimmering Path is here! Test your mettle in the brand new Skirmish Mode, have a hand at completing the now bug-free Thaddis Sabbah mini-campaign, or check our the AI and Balance changes that we have added with this release. This release comes bundled with an event, where the player who has gotten the furthest in the new Skirmish Mode by Sunday 24 June 2018, 11:59PM GMT+0 (one minute before the day to Monday 25 June) will get the chance to work work together with the developers to realize one of their ideas (or wishes) in the FXmod. The event details can be found in their entirety here: Moddb.com (Articles tab). For more info on Skirmish mode itself check out our recent newsletter. The Patch Notes for this version can be found on the [Forum] page as usual. They have also been included with the download as a separate document. This download comes with an installer which will automatically install the mod to the proper location. As usual, please remember to set the game language to English (Steam users: right-click Homeworld Remastered Collection > Properties > Language), and to report any bugs or technical issues you may run on our forum tab. If you have any issues, let us know below or on the [Forum] page. Thank you for your support, and we hope you enjoy this release. Yes, all versions of our mod that are v1.25 or higher support both 2.0/2.1 and 2.205 of the remaster. how can I choose installation path? The installer should automatically detect the location of your HomeworldRM folder, and put the mod files in the right place. What happens when you use the shortcut the installer created? Unless I run Validate integrity of game files I can not get the text back to normal, 1 file gets repaired. Was wondering why this mod just wasn't already setup in the mods like complex is and others? Wait, you are steam user? Then why not subscribe our mod in workshop in the first place? You've probably subscribed the Chinese version. How can the asteroid resources be increased? setting resource multiplier to high only gives 3600-6300 max resource per asteroid. Is this the normal amount? I remember in homeworld 2 classic it can go way higher. It depends on the map. Some (FXmod) maps give fewer resources per asteroid, others (e.g. Idolum) give a lot. We are adding 5000 and 10000 RU Injection options in the next build, so you can use these if you find the asteroids on the map lacking. Got it, thanks. This mod is awesome btw. Thanks for your kind words! It's been much of the same experience for me, actually, to the point where the project is keeping me wired to the franchise overall. We'll keep trying to meet your expectations. 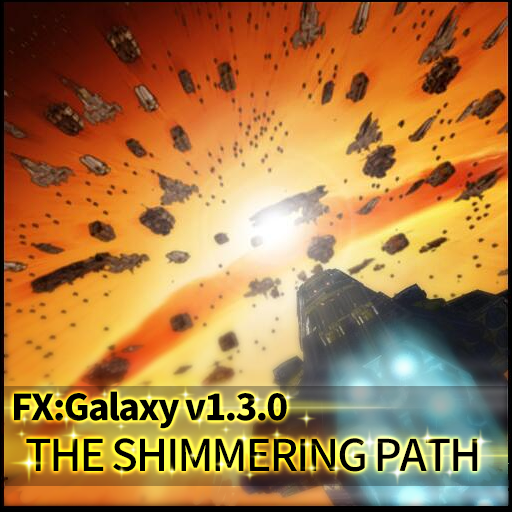 FX:Galaxy v1.30 - The Shimmering Path has not been tagged yet.